Contact & Access | How do I get to Les Pins campsite in Saint Palais-sur-mer ? You already know what luxury mobile home with kitchen and private covered terrace you intend to rent for your next holiday at the campsite Les Pins near Royan. You know that our outdoor hotel has an aquatic area with a heated pool, a restaurant and several children’s games. That said, as you like to find wherever you go what you are entitled to expect, you want answers to all your questions before packing your bags for Charente-Maritime. 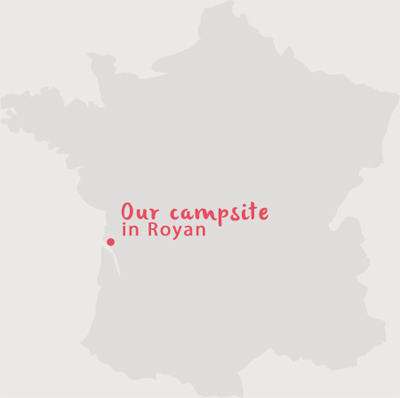 You will see that it has never been easier than to go to the campsite Les Pins in Charente-Maritime! From Paris: A10 to Saintes, N150 to Royan, D25 direction La Palmyre. From Nantes: A83 to Niort, A10 to Saintes, N150 to Royan, D25 direction La Palmyre. From Bordeaux: A10 to Saintes, N150 to Royan, D25 direction La Palmyre. Airport of Bordeaux-Mérignac and La Rochelle – Ile de Ré.